Millions of dollars are spent on mail to customers and prospects each year. Yet nearly 6.6 billion mail pieces were undeliverable in 2016* and most of it was avoidable. In addition, a significant portion of delivered pieces did not take advantage of available discounted rates. That begs the question… why pay for mail that doesn’t reach its destination or costs more than necessary? You can avoid most of these costs by understanding the USPS mail design requirements. Some deliverability issues can also be avoided through address correction but that’s a topic for another post. If you don’t follow the USPS’ mail design requirements, you’ll either pay more for postage or your mail will not be delivered. Because understanding USPS requirements will keep you from throwing away your mailing dollars, we prepared a summary to help you avoid common pitfalls. For those who want to dig into the nitty gritty, you can read a detailed USPS report here. Minimum size of any mail piece is 3.5″ x 5″. Anything smaller is considered unmailable by the Post Office. not recommended for mail pieces. 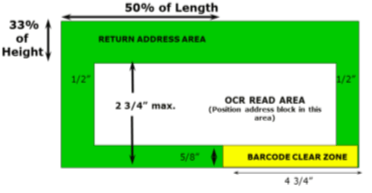 The return address on a letter-size piece should not appear in the OCR (Optical Character Recognition) Read Area, but be placed above 2-3/4” from the bottom of the mail piece (green area on the example) and extend no more than half the length of the envelope. The Barcode Clear Zone extends 4-3/4” from the right edge and 5/8” from the bottom edge of the envelope. This is where the USPS places its automation barcode. There should be no printed numbers, text or graphics in this area to interfere with scanning equipment. The complete address and/or barcode must be fully displayed at all times, even if contents shift. There must be a minimum of 1/8″ space on either side of the barcode and address within a window. There are a number of requirements/restrictions on placement of the barcode in an address. Self-mailers are just that – they are self-contained and mail without an envelope. Gatefolds, Accordion and Z-fold are non-machineable and qualify for discounted pricing. which can be viewed on the USPS Website. You can find information on these two topics in the complete report. Becoming familiar with the design requirements of the USPS is vital to ensuring your mail can be delivered and automation discounts are applied. Having the right equipment and processing tools to meet mailing standards is critical. Check out our addressers, mail machines, folder/inserters and document processing options for more information. If you need help, contact us at 303-761-0681 or the USPS MDA Support Center at 855-593-6093. Why Isn’t the U.S.Postal Service Profitable? What if Congress passed a law requiring businesses to prefund employee healthcare and pensions for 75 years in advance? Can you imagine how that would impact your company financially? It’s interesting that Congress requires 100% funding for 75 years in advance for the USPS when,according to The Motley Fool,the U.S. Government is only 42% funded. What if you couldn’t increase your pricing based on changing market conditions (such as rising fuel costs or competitive pressures)? What if you were required to distribute your goods/services to a broader market, even if that market was unprofitable? Welcome to the Postal Service! These are just a few restrictions that the USPS must grapple with. Each of these individually would have a significant hit to the profitability and sustainability of a company. Collectively, they’re nearly untenable. Remember, the USPS does NOT receive and revenue from the American taxpayer, their only source of revenue is for products and services! They cannot add a fuel surcharge to pricing (as FedEx and UPS can) to maintain profit levels. They are required to provide service to people and businesses in remote areas even though it may be highly unprofitable. In fact, the USPS delivers packages for UPS and FedEx in geographic areas UPS/FedEx consider unprofitable. Plans to develop an online payment system in 2000 were scuttled when the Internet industry cried foul. In-store sales of phone cards and money transfers. Selling postal meter cartridges (Pitney Bowes objected). The USPS is required to invest exclusively in government bonds while private companies can invest in a wide variety of securities to improve profitability. The USPS is forbidden by law to lower prices to get more business. first class delivery, cost at least two to three times more than in the U.S. Many projections around elimination or privatization (full or partial) of the Postal Service paint a picture or greatly increased prices and decreased service levels and quality. So, what’s the answer? How about if we consider a simple solution? What if we just got out of the way (by relieving the USPS of unnecessary burdens) and let them run their business as a business? How Does the Postal Service Change Rates? How many times have you or someone you know said this about postal rates for office postage meters and stamps? Postal rate increases (and the rare decrease) are often so small and frequent that it doesn’t seem worth it. People often wonder if the costs of implementing a one or two cent increase outweigh the resulting revenue increase. Yet nearly every year (with some exceptions) we see rates go up a penny or two. What most people don’t know is that the USPS is severely constrained by laws and regulations including the Postal Accountability Enhancement Act (PAEA). Many also don’t realize that the USPS is not a department of the US government. In other words, it isn’t organized under any of the executive cabinet departments. It was reorganized in 1971 under the PAEA, to be an independent establishment of the executive branch of our government. As such, it has neither government funding nor the freedom to set its rates and policies in the ways that a free-market, for-profit corporation does. Considering these and other factors outside the purview of this post, they’re placed in a situation in which it’s quite difficult to succeed. The USPS is not tax funded, but is an independent establishment of the federal government. Revenue is earned exclusively from product sales. Learn more here. $71.5 billion in revenue for 2016 would put it in the top 40 Fortune 500 companies if it were independent. The Postal Service operates two lines of business: one for “market dominant” products (First-Class Mail, Standard Mail, Media Mail, etc.) and one for “competitive products” (e.g., Priority Mail, Express Mail and First-Class Package Service). Each line has its own regulations and pricing rules that are administered by the PRC. While rate adjustments are a fairly in-depth topic, a key factor in determining rates for market dominant services (which account for 74% of USPS annual revenue) is the Consumer Price Index (CPI). When the CPI goes up, rates can be increased; however, when the CPI drops, postal rates must be lowered. Because they are constrained by the CPI, the USPS can’t respond to competitive pressures such as rate changes by UPS or FEDEX, who can increase their pricing at will. Do you receive a significant number of parcels and important documents? Are you finding it hard to handle and keep track of them? 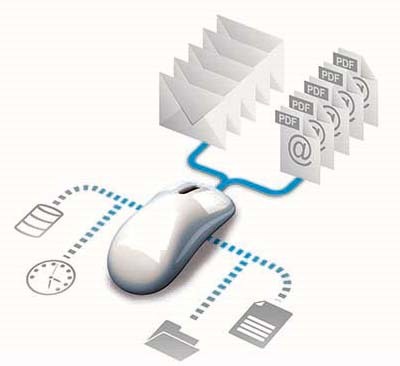 Do you know where important files or documents are at all times? Would it be helpful to receive an email notification when a time-sensitive document arrives? Are you wasting valuable time manually inputting incoming mail and parcels? If you answered “yes” to one or more of these questions, then read on to see if a parcel and document tracking solution might benefit your organization. 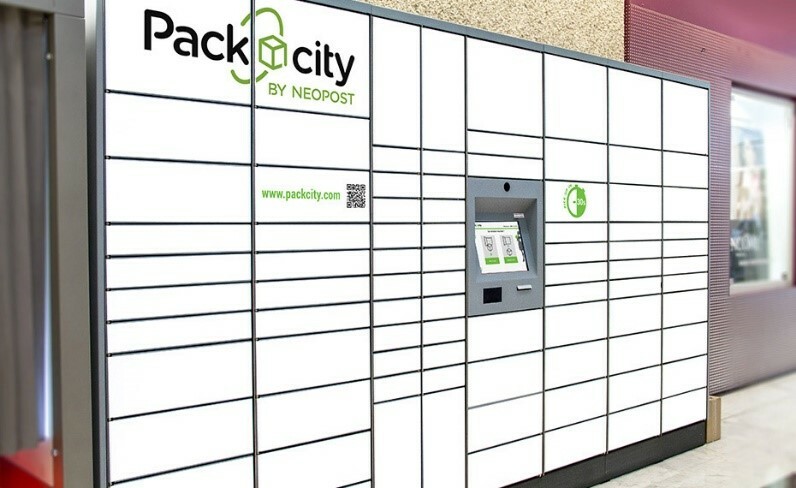 Neopost WTS is a scanner-enabled chain of custody tracking system for inbound mail, parcels, files and objects (such as electronics, furniture, tools, supplies, etc.). These items can be scanned into the system upon receipt. Scanning is then used to track any handoffs or checkouts from that time forward. With WTS you’ll know exactly where every received parcel, document or item is at any time. Available as either a premise or web based solution, WTS is scalable from small single-location businesses to large enterprises with multiple locations. Clients have used WTS for tracking company assets such as laptops, golf clubs, tools and equipment. Assets can be checked out for use and then checked back in. No more missing assets or wasted time tracking them down… you know where they are at all times. This applies to assets to be used both on and off-site. Evidence tracking is another example. Police stations can use WTS for keeping track of evidence. The evidence is either in the evidence locker or it’s checked out to a specific person who is held accountable for it. In addition, this provides chain of custody tracking. Eliminate loss of expensive equipment and parcels. 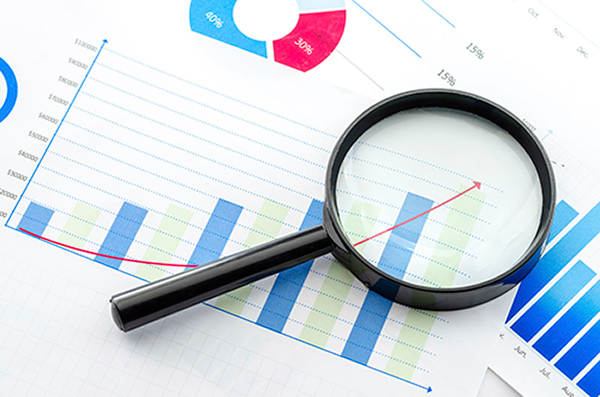 Provide accountability through chain of custody tracking. Automatically notify recipients of arrival of packages and parcels. If you have any questions or want to learn more about how a tracking solution could benefit your organization, contact Paul Johnson at 303-761-0681 x211 or pjohnson@cms-colorado.com.